King Starboard is a marine-grade polymer, which means it's a high-tech plastic that will stand up to salt water and sun a lot better than most types of wood--without a lick of maintenance, and often at lower cost. This tough marine polymer won't rot or absorb water, so it's a great solution for swim platforms, hand rails, steps, dinghy chocks, fish-cleaning tables and other applications. "My milled starboard arrived in the mail yesterday. It was just as the doctor ordered! Thanks for the quality work and prompt service." What it can do. You can work King Starboard with standard woodworking tools and assemble components with standard screws and fasteners. The stuff can be notched and bent around curves, and joints can be joined with specialized plastic welding equipment (but should still be mechanically fastened). I've used King Starboard to make instrument enclosures, shelves, cabinets and the like for customers who needed them to fit in weird places full of odd angles and curves--and I'm sold on this material as a faster, longer lasting, economical alternative to marine wood products in many situations. King Starboard AS (Anti-Skid). In addition to all the qualities I've listed above, King Starboard AS (Anti-Skid) offers an excellent skid-resistant solution for ladder treads, our custom shower and cockpit grates, swim platforms and any deck location where non-skid footing is a critical concern. Starboard AS has a grippy dot pattern on one side that's molded--not laminated--right into the polymer sheet, and will last the lifetime of your boat. 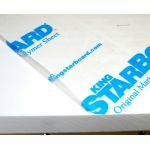 Colors: We stock standard King Starboard in five colors--White/White, Black, Sanshade, Dolphin Gray and Seafoam. If I don't have the color you need, I can most likely get it (in full-sheet quantities only). 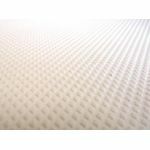 I also have 1/2", 3/4" and 1" White/White King Starboard AS (Anti-Skid) by the sheet, half-sheet and square foot. A good choice for replacing boat dashboard instrument panels. Fairly flexible, so best used in relatively small sizes if unsupported. A bit stiffer than 1/4", so can be used in somewhat larger panel sizes. This thickness is good for vertical drawer sides and dividers, etc., and we use it for the backsplashes on our fish-cleaning tables. Fine for drawers and door panels (we use 1/2" panels in our boat doors for example, set inside 3/4" frames). If you lay a piece of 1/2" Starboard over a solid substrate such as marine plywood, it'll also serve well as a rough-and-ready fish-cleaning station. And using Starboard AS (Anti-Skid), this is fine for fully supported step and stair pads. This is what we use for the tops of our own fish-cleaning tables (supported underneath with a couple lengths of hefty aluminum "U" channel). And it also goes into the frames of our stock and custom-design boat doors. This thickness is also peace-of-mind dandy as backing blocks for lifeline stanchions and other fairly high-load deck hardware. So long as it's supported by solid frame members around 12" - 14" apart, 3/4" Starboard can handle a fairly heavy load with no problem -- including swim-platform applications. This is heavy stuff, right at 5 lbs per square foot. If you have a big, wide-beamed, heavy-displacement power boat that can support the weight, 1" Starboard and Starboard AS will make for a fine swim platform (again, properly supported with closely spaced frames). It also serves well as mounting pads and/or backing blocks for very heavy-load hardware such as anchor windlasses and big sheet winches. Even heavier, at 7.5 lbs per square foot. We use 1.5" Starboard in fabricating our Dinghy Rail Chocks, and they work fine as on-deck or on-dock supports for RIB's, jet skis weighing several hundred pounds and more. Some of our customers also use it for extra-heavy-duty mounting pads, leaning-post rocket launchers, and so forth.